Heathrow Airport is the busiest airport in the UK and Europe. It’s also the second busiest airport in the world when measured by the international passenger traffic. In 2016 the airport handled 75.7 million passengers, representing an increase of 1% compared to 2015. This page offers everything you need to know about Heathrow arrivals. It’s also an overview of the airport and its procedures for those who are arriving, departing, and meeting others. Checking flight information is much easier today than it once was. Not too long ago checking flight information would require an individual to be physically present in the airport. This is no longer the case and it’s now possible to check exactly where a flight is in real time. To search for Heathrow flight information, it helps to have the flight code of the flight you want to track. The flight code consists of a short sequence of letters (denoting the flight carrier) and numbers (the flight number). The flight code is printed on your tickets, and should be included in any confirmation e-mails you receive. You can easily check the status of any flight either using the overview below, or by using smartphone apps. If you are due to meet a friend or family member, maybe even a business associate, at the airport then you will want a way of monitoring their flight status so that you can be there when it lands. Again, not long ago all you could do was turn up to the airport when the flight was due and if it was delayed you simply had to wait. Flight Radar is an online service which is able to track the exact position of flights in real time. The online tool is incredibly simple to use and even allows users to filter out flights according to certain criteria. In this way, users can narrow down the flights displayed and locate a flight without knowing its number. All they need to know is where it is going to and from. If you can make an educated guess as to where it would be on its journey then it should be easy to locate. The other way to see Heathrow arrivals live is to look on the airport’s website. In fact, Heathrow operate their own Flying Messenger service which can provide automatic updates concerning a flight. But also informing a nominated individual when the flight is approaching its destination. Those who have a layover at Heathrow can use Flight Radar’s flight tracker to keep up to date with the status of their connecting flight. You can even set up Flying Messenger so that when your connecting flight is approaching Heathrow you can receive a text alert. This way you give yourself time to head on over to the right terminal. When you touch down in Heathrow, using either the Flight Radar app or website gives you the quickest and most convenient way of ascertaining when your connecting flight is due, where it will depart from, and what time you need to be there in order to board. The Heathrow Express is a rail service that runs between Paddington station and Heathrow Airport. The Express takes just 15 minutes to reach Heathrow from Paddington compared to 51 minutes by tube or 42 minutes by car. You can save money by buying online in advance. This reduces a single ticket from £27 to £22, and a return from £42 to £37. 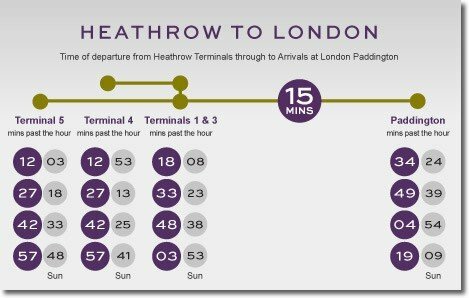 The Heathrow Express Timetable is very simple to remember, Monday – Saturday the first train departs at 5:10 am and then at 25, 40, 55, and 10 minutes past every hour until 23:25. On Sundays, the timetable remains the same but the first train departs at 6:10 instead. Heathrow is easily accessible via a multitude of public transport options. In addition to the Heathrow Express, First Trains operate the Heathrow Connect service. This is similar to the Heathrow Express service, although it runs with slightly less frequency, running between Paddington and Heathrow every 30 minutes. Unlike the Express service the Connect service stops between Paddington and Heathrow, this means that you can join it further down the line. There are several different operators running bus services to Heathrow. These include National Express and megabus.com. These buses are slower than trains but can be used to reach many more areas. If you are picking someone up for Heathrow arrivals in the car then the best route to take will depend on which terminal you are hoping to reach. 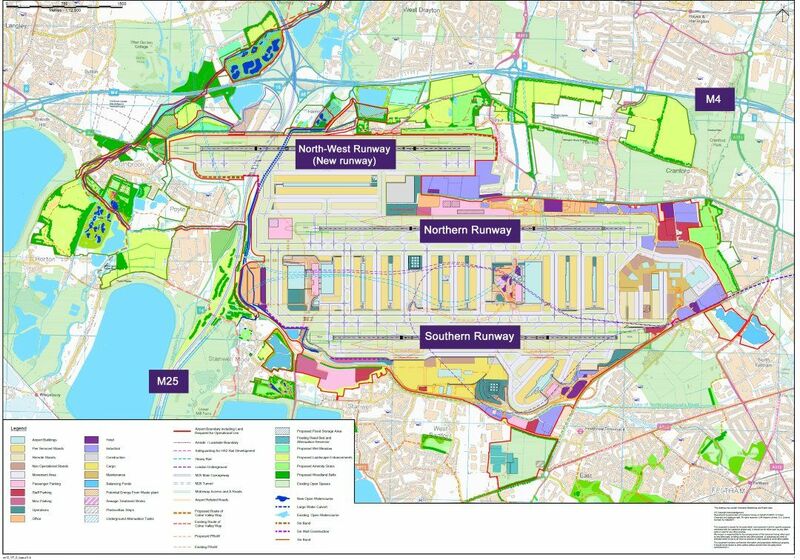 Many people visiting Heathrow for the first time are unprepared for just how large and sprawling the airport is. For Terminals 2 and 3, you will want to exit the M4 at Junction 4, or the M25 at junction 15. The directions are then clearly signposted. For Terminal 4 you should exit the M25 at junction 14 and follow the road signs. Terminal 5 has its own access road which is also accessed after leaving the M25 at junction 14. If you are picking up passengers at Heathrow arrivals, you should make sure to check the weather forecast before you set off as bad weather can delay flights and also create unexpected congestion on the roads. If you need to rent a car there are a number of companies that work with Heathrow, such as Route Plan Car hire. Terminal 1, known simply as Terminal is no longer in use, having been decommissioned in 2015. Terminal 2 is used by Star Alliance, Aer Lingus, Eurowings, Flybe, and Icelandair. Terminal 3 features a Oneworld lounge and is the departure terminal for Delta Air Lines, Garuda Indonesia, Middle East Airlines, Virgin Atlantic, and a few other small non-aligned carriers. Terminal 4 hosts the SkyTeam lounge and serves Malaysia Airlines, Qatar Airways and most of the non-aligned airlines. Finally, Terminal 5 serves most British Airways flights, as well as Iberia and Iberia Express. The shuttle buses at Heathrow are operated by Hoppa. Terminals 2 and 3 are located within walking distance of one another. Terminals 4 and 5 are served by both buses and trains. If you have a connecting ticket, then you can take advantages of the airport’s Flight Connections buses. These buses transport passengers to the necessary departure terminal without having to leave the passenger-only area. Travel between terminals at Heathrow doesn’t get quicker and easier than the free train service that Heathrow runs. The shuttle trains run between Terminals 2&3 to Terminal 4, there are four trains an hour and the journey time is roughly 20 minutes. The arrangements are the same for travel to Terminal 5 except the trains run every 15 minutes. There are a range of taxi and minicab services that you can use to get to and from Heathrow Airport. Minicabs need to be booked in advance. You can also hail one of London’s iconic black cabs on the street, or find them at taxi ranks. There are many taxi services offering Transport to Heathrow (taxis/minicab), the ones available to you will depend on where you are travelling from. One-Number Taxi and Computer Cab both serve London in its entirety. Other services run only from specific areas. Your best bet is to look online for a local company. Then you can ask them if they can offer any special deals when travelling to Heathrow. Depending on how many of you are travelling in your group you can hire either a standard sized car for seating two or three people, or look into minibuses designed to cater to a dozen or more people. There is a minimum charge of £2.60 for any taxi ride. Once the taxi has travelled for six miles then the rate at which the fair increases changes and begins to increase slower. From the Heathrow arrivals gate, you can easily find a whole line of taxis waiting to pick up passengers. These taxis can ferry passengers within the airport complex and can be a quick and efficient way of travelling between terminals as well as nearby hotels. Travelling from Heathrow to London in a taxi costs between £48 and £90. There are a wide range of options when it comes to finding a Heathrow hotel. The choices on offer account for all price ranges and tastes. The Premier Inn and Travelodge are available for those who only need the most essential features. Right the way up to the swanky and upmarket Sofitel, a four-star hotel with three restaurants inside. If you want to stay in one of the central London hotels, it’s a good idea to compare hotels before you travel in order to get one with a good price. Less than 2 miles from Heathrow is the Mercure Hotel. This three-star hotel costs £106 per night and offers excellent access to the motorway. Which puts the rest of London in easy reach. If you don’t want to go that far, however, then there’s the Sheraton Heathrow. This hotel is a mere 10 minute walk from the airport. If you are planning on spending several days in the capital then you might want something a little more comfortable, more personal, and a little homelier than a hotel. If that’s the case, then you should look into renting an apartment for the duration of your stay. You can even use Airbnb in order to get yourself a fantastic deal on a stay in an apartment. The Hoppa Bus Heathrow is an initiative which began at Heathrow and has since expanded to other London airports. The Hoppa Bus offers travel around Heathrow, Gatwick, and nearby areas of London. It is a very useful service for those who are touching down at Heathrow arrivals before catching a connecting flight from Gatwick. The Hoppa Bus is a convenient airport shuttle and costs £4.50 per ticket when purchased online in advance. Each fee-paying adult can be accompanied by one child aged 5-15. Children under 5 ride for free. If tickets are purchased from the driver, they are £5 one way and £9 return. The National Express London is probably the most popular way for visitors to shuttle around the airport. However it is just one of a number of services available at Heathrow. If you are looking for a coach to take you in to a hotel in Central London, then you should catch a bus from Heathrow central bus station. Note that London buses do not accept cash. You will need to have either an Oyster Card, a contactless payment card, or a pre-paid pass such as a Day Travelcard. 10. Heathrow arrivals: Where to Park? Heathrow Official Parking is highly rated by visitors and is one of the cheapest airport car parks in the country. There are parking facilities running along the Northern edge of the airport with additional parking located between Terminals 2 & 3 and a final car park just south of Terminal 4. Heathrow arrivals parking is available in the forecourt of terminal buildings. Motorcycle parking is free at Heathrow Airport. Motorcycles are free to park in either the short or the long stay car parks. Heathrow pickup parking is clearly signposted and there is one for each terminal. For Terminal 2 the meeting point is located opposite the exit to international arrivals. For Terminal 3 the meeting point is located outside the arrivals building. Terminal 4 has its pickup point just next to WH Smith and for Terminal 5 there are two meeting points. The North meeting point is opposite Travelex and the South meeting point is near the orange staircase near Costa. Public transport operators have obligations to passengers under equality legislation.They are required by law to have procedures in place to transport disabled passengers. It might be worth phoning ahead and speaking to the transport company just to be sure, as they may need to arrange to have someone bring a wheelchair ramp for Buses and Coaches, for example. Similarly, if you will require any on flight assistance you should inform Heathrow ahead of time. When you arrive at Heathrow arrivals, and if you need special assistance, then you will find help in the Special Assistance host areas. There is one in every terminal. For passengers who require peace and quiet there is a quiet area in Terminal 3. If you travel with an assistance dog, then be sure to let the airline know in advance. Unlike pet dogs, you are allowed to travel on a plane while accompanied by an assistance dog. However, the airport has a legal right to demand proof that the dog has been trained through an accredited course. If you require any special mobility equipment, let staff know before you arrive so they can have it ready. Heathrow contains all the disabled facilities that you would expect from a major airport. There are disabled toilets located throughout all terminals. Security staff at the airport have an obligation to carry out a hand search of passengers whenever their metal detectors are set off. If you are in a wheelchair then this will almost certainly be the case. You can request to have the search performed away from the main area. Alternatively, you are free to walk through the arch if you desire. If you or another member of your party requires medical assistance, simply dial 222 from any internal telephone. By doing this, you will ensure that the operator can instantly see where in the airport you are. Also the Heathrow medical services will promptly dispatch to your location. For less serious medical issues, there is a branch of Boots in each of Heathrow’s Terminals both before and after security. The Heathrow medical centre is located in the North West corner of the airport complex. When you land at Heathrow arrivals then you will need to go through passport control UK and customs. The purpose of customs is to prevent contraband from entering the country. If you are unsure whether you can bring all your items through customs with you then you should phone ahead, UK customs contact is 0843 504 7190. If you don’t want to take anything you have with you through security you can take advantage of left luggage. Left luggage Heathrow allows you to store items for a few hours or up to 90 days. Airport security is necessary, but it can still be an annoyance and inconvenience to travellers. Fortunately advances in technology have helped, such as the introduction of face scanning technology. Heathrow security is as heavy as you would expect from a major international airport. However, for the seasoned travellers the security checks are what you will have come to expect. Many travellers who pass through Heathrow end up staying within the airport for some time. Whether you are there a few hours or a few days, you will be glad to know that there is plenty to keep you amused. In addition to the extensive range of retail outlets and restaurants, you can make use of airport luggage storage to store extra baggage and then take advantage of Heathrow Airport lounge access. While there, Heathrow Wi-Fi is free for the duration of your stay, although faster pay-as-you-go Wi-Fi is also available. Click here to see the cost of using the left baggage facility. Heathrow is home to a number of cafes and restaurants which cater to a broad range of tastes and desires. Outlets such as Costa (Terminals 2, 3, and 4) and Nero (Terminal 2) are perfect for a little pick me up dose of caffeine and a sandwich. Or if you want an authentic Italian coffee house experience then head on over to Ca’puccino in Terminal 2. If you want something a little more substantial then Heathrow has you covered there too, The Five Tuns, in Terminal 5, brings a traditional pub experience to the airport environment. The Five Tuns serves a range of bottled craft and draught beers, as well as an extensive collection of wines and spirits. The Steak & Lobster Heathrow is a four-star restaurant and one of the best restaurants near Heathrow. It’s an absolute must try experience for those who are fans of a simple, easy-going menu. The Steak & Lobster is a restaurant that really knows its market and its audience and delivers them the perfect dining experience. The Limeyard Staines offers an all-American dining experience with everything you could possibly want from an American themed restaurant; buttermilk pancakes, Coke-glazed ribs, and the house special, Baja tacos. You can look online for London restaurant deals to find some excellent bargains on some of the best food that the capital has to offer. Heathrow Airport is host to a wide range of shops including High Street favourites like Boots and Hamley’s to high end branches of Harrods and Burberry. There is something for everyone located within every terminal. You can find a full guide to the shops and where they are located on the Heathrow website. There are lots of family friendly facilities at Heathrow Airport. There is a Heathrow Play Gym in terminals 2, 3, 4 and 5 which is open from 6am to 9pm every day. Terminal 3 is also home to a family lounge and a gaming zone for older children. The airport also has plenty of baby changing facilities both before and after security, and family friendly restaurants. In addition to the numerous retail and food outlets in the airport, there are also plenty of things to do in the local area. There are numerous public transport links between the airport and London, both Thorpe Park and the London Eye make excellent days out if you’re travelling with family. Do you have a few days to spare? Then why not consider purchasing a London Explorer Pass? Such a pass allows for access to a variety of attractions throughout the capital. This will save you money on entrance fees and also saves you time by not having to wait in line. When Heathrow is a layover stop for you then there are a variety of layover tours that you can participate in. If you are planning a layover before you get to Heathrow, then check out this list of the best layover spots. Extreme weather conditions, even hot weather, can cause flights to be delayed and roads to become congested. You should check the weather forecast before you set out to the airport. You can use the tools available from Flight Radar to easily and quickly identify whether the flight is delayed. Checking traffic is unfortunately not as simple but there are a number of websites that will tell you of any road traffic updates. If you are picking someone up from arrivals, then you can check the weather around the airport here. At numerous points throughout the airport visitors can pick up leaflets and view information screens. These screens give an overview of the kind of shopping and entertainment opportunities that exist. Additionally, the airport has a number of passenger ambassadors who roam the various terminals. Ambassadors are always ready to offer passengers advice should they need it and answering any questions that they might have. These ambassadors are a crucial part of the high quality Heathrow customer service that the airport provides. There is also an information desk in each terminal which will be manned at all times.